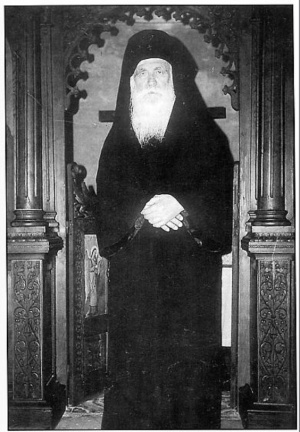 Blessed Elder Archimandrite Philotheos Zervakos of Longovarda (1884-1980) is a well-known 20th-century Greek Orthodox elder, from Paros island, and spiritual son of St. Nektarios of Aegina. He was imprisoned twice by the Turks during the final years of the Ottoman occupation of Thessaloniki and many have witnessed the saint to "float/walk on air". Although he has not been glorified he is considered a saint in Greece. Blessed Elder Archimandrite Philotheos (Zervakos) was born in the small and remote village of Pakia in Sparti, Peloponesse, Greece, in the year 1884 and was given the name of Constantine at his baptism. From childhood he demonstrated an exceptional love for God. He was 18 years old, when he was inspired by the 54th Psalm to follow the monastic life. He departed from his paternal home with neither shoes or any possessions; he only had his tunic and a small gospel. In 1912, April 22, Father Philotheos was ordained to the priesthood by Metropolitan Gabriel of Trifilia and Olympia. In 1924, he made an extensive pilgrimage to the Holy Land and Egypt. This is all described in his book published in 1925, Great and Wondrous Pilgrimages to Palestine and Sinai. In 1930, Elder Ierotheos reposed, and Fr. Philotheos succeeded him as abbot of Longovarda. By this stage, Fr. Philotheos had the reputation of a saint. In 1934, he made another pilgrimage, this time to Constantinople. He returned to Greece and founded the convent of Panagia Myrtidiotissa Thapsanon (The Virgin of the Myrtle Tree), 4 km from Lefkes on the island of Paros, Greece. During his life, he built 12 churches, two monasteries, three cemeteries and two schools. The money he would receive from the faithful he would distribute to the poor, the widows and the orphans. On the morning of May 8, 1980, the blessed Elder Philotheos died in his cell at Thapsana, Paros. His funeral was conducted by Archimandrite Dionysios of Simonopetra Monastery of Mt Athos. His relics were laid to rest at the convent in Paros, in a place that he chose beside the chapel dedicated to his spiritual mentor, St. Nectarios of Aegina (November 9). "I am proud of the cassock I wear and consider it more valuable and seemly than every other kind of garment, even than the royal purple robes of kings. I consider myself unworthy to dress in such a modest, honorable and holy garb, which was honored by numberless monastic saints, hieromartryrs, confessors and holy ones. I am saddened by and pity those clerics who reject the cassock and who shave their beards." "In this present evil generation, the spiritual father must use oeconomy, for, is he implements exactness (akrívia), none, or only a few, of those coming to confession would be found worthy of receiving Holy Communion. The greatest care and discernment is necessary, however, and the spiritual father must pray fervently to the heavenly God and Father to enlighten him as to how to implement oeconomy." The Blessed Elder Philotheos Zervakos by S. Kementzentzidis, trans. by Palis and Chalice, Thessaloniki: 1986. Blessed Elder Philotheos Zervakos by C. Cavarnos, Institute for Byzantine and Modern Greek Studies, Belmont, MA: 1993. A Great and Wondrous Pilgrimages to Palestine and Sinai, the Wayferer by P. Zervakos, 1925. From the Holy Monastery of Panagia Myrtidiotissa, Elder Philotheos wrote a well-known apologetic in 1976 addressed to Archimandrite Cyprian. This letter (cf. External links) is considered of extreme historical importance in the Orthodox Church since it is written in defense of his spiritual father, St. Nectarios of Aegina. The Errors of Apostolos Makrakis. ↑ The most reverend Cyprian, Dr. Theol., is the Metropolitan of Oropos and Fili and President of the Holy Synod in Resistance, Orthodox Church of Greece. He is the spiritual son of Elder Philotheos. Elder Philotheos (Zervakos) Defends His Spiritual Father, St. Nectarios of Aegina: A Momentous Letter of Historic Importance (PDF) Άγιος Κυπριανός, No. 323 (November-December 2004), pp. 114-116. This page was last edited on April 10, 2012, at 16:05. This page has been accessed 29,541 times.